This has got to be one of my favorite series from Zonderkidz! The Next Door Series. 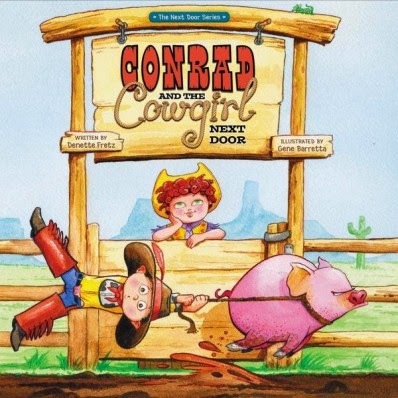 Conrad and the Cowgirl Next Door takes Conrad to cowboy training at his Uncle Clint's ranch. Conrad is prepared with his "Mega Ultimate Extreme First Aid Kit" for everything he may encounter. As Conrad learns his way around the ranch, he finds need for his First Aid Kit very often! Things he learn are : Don't squat with spurs on, Don't lasso pigs, Don't pet untame barn cats and more. Of course there is neighbor Imogene Louise Lathrop who has to be present each time Conrad is learning his lesson; giving her two cents worth. Can we say "know it all"! That is Imogene. And to make matters worse, she rides off with the horse that Uncle Clint was trying to get for Conrad to learn on while he is stuck with a llama! This book is hilarious in so many ways. The illustrations go perfectly along with the written word! Conrad keeps his cool, and between his First Aid Kit and the Word "love your enemies", Conrad is able to come out the big man on top!